Will Wintermute be able to hold onto control of her beloved city? Tensions reach a breaking point after the murder of the Animata - an elite force comprised of animal/tech hybrids. Conspiracies tighten around Adam and his companions as a bloody interspecies gang war explodes in the City by the Sea. From the brilliant mind of creator/writer Marguerite Bennett (INSEXTS, DC Comics Bombshells, Batwoman) with artwork by SHIPWRECK's Eric Gapstur, ANIMOSITY: EVOLUTION expands upon this already amazing world! 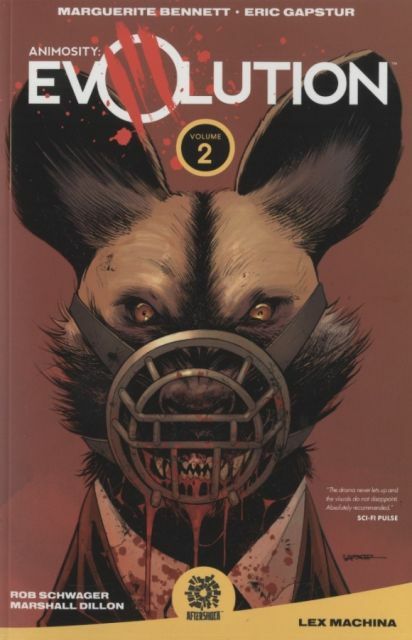 Volume 2 contains the entire second arc, issues #6-10.